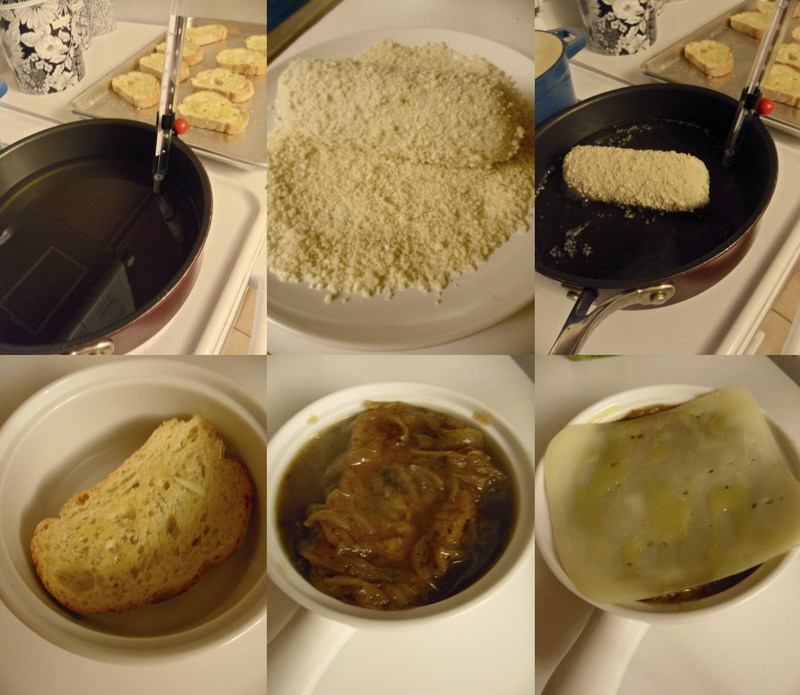 Last Thursday was Beaujolais Nouveau opening day and so I wanted to make a traditional French meal for the occasion. Beaujolais Nouveau is a red wine made from Gamay grapes produced in the Beaujolais region of France. It is the most popular vin de primeur (new wine), because it is fermented for just a few weeks before being released for sale on the third Thursday of November. 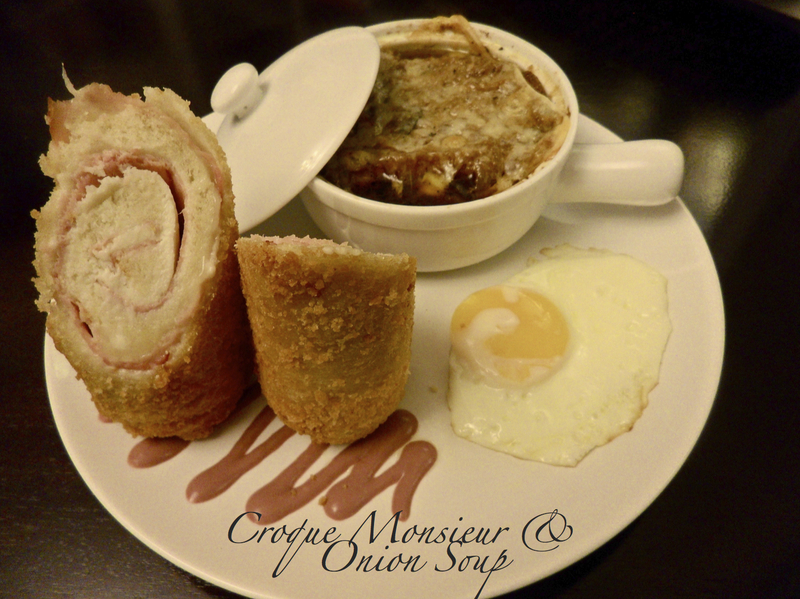 I really wanted to make Julia Child’s onion soup and the Croque Monsieur is a really great pairing with that. The translation for Croque Monsieur means “bite of man” but it’s really just a ham and cheese sandwich that is rolled, crusted with panko and then pan fried. What I love about this meal is that everything but the soup gets made the night before so it would be perfect if you were entertaining and you didn’t want to be stuck in the kitchen all night. The night before I started by making the Bechamel for the sandwiches. Melt 2 tbsp unsalted butter in small saucepan over medium heat then add 2 tbsp all-purpose flour and cook 3-4 minutes. 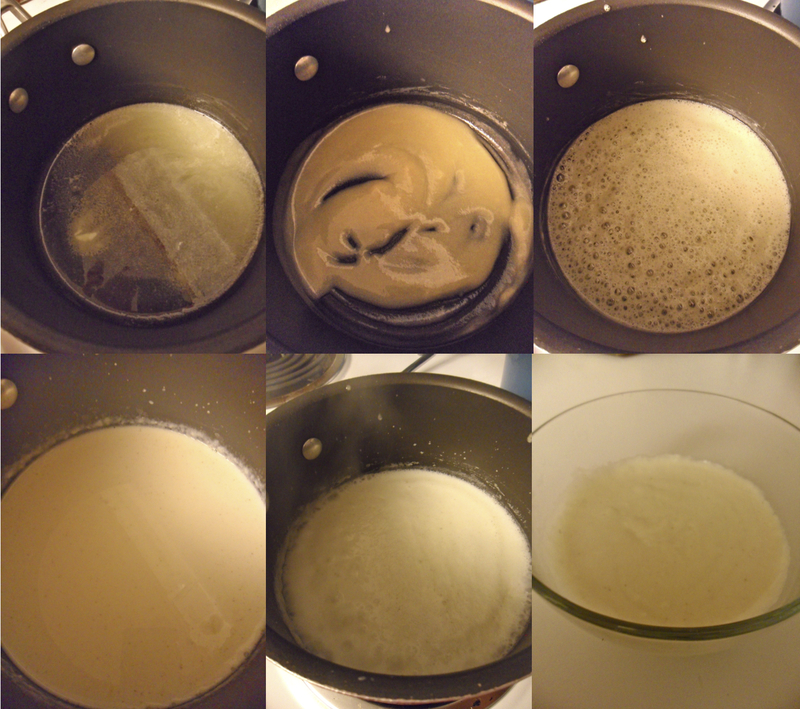 Slowly whisk in 1 cup whole milk and bring to a boil. Reduce the heat to low and cook until thickened, about 5 minutes. Remove from heat and cool completely. Next I made the sandwiches. Trim all of the crust off of a loaf of unsliced french bread (I used a French Miche), and cut as thin of slices as you can. I found the easiest way to do this was to hold the loaf the longways and cut from the top to the bottom of the bottom of the loaf using a long bread knife. 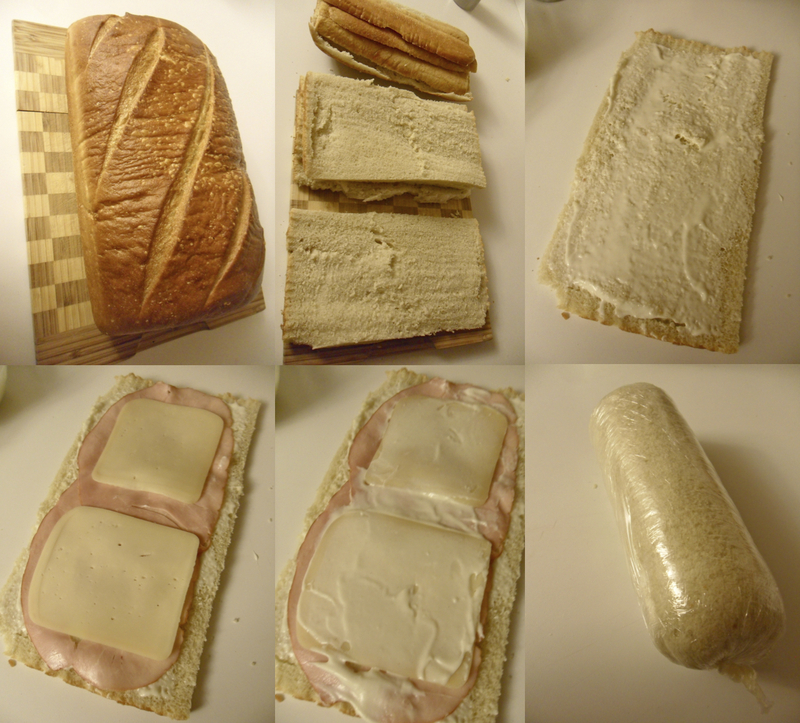 I got 4 good slices from the loaf so I made 4 sandwiches. Spread a thin layer of the bechamel, followed by a layer of french ham, a layer of gruyere cheese and another layer of bechamel. Roll into a cylinder and wrap in plastic, rolling it towards you in the plastic wrap to get the roll as tight as you can. The sandwiches go in the freezer overnight. The last thing you can do the night before is make the mustard violette. Place 3/4 cup pinot noir and 1 cup red seedless grapes in a small saucepan over medium heat. My great-uncle makes his own so I used that and got a really bold flavor that was amazing in the end but you can use any pinot noir. Cook until dry, about 10 minutes. Transfer to a blender and add 1/4 cup creme fraiche and 2 tbsp dijon mustard and blend until smooth. I used whole grain dijon because that’s what we had so I put the mustard through a fine sieve before putting it into a squirt bottle. Put this in the fridge overnight. 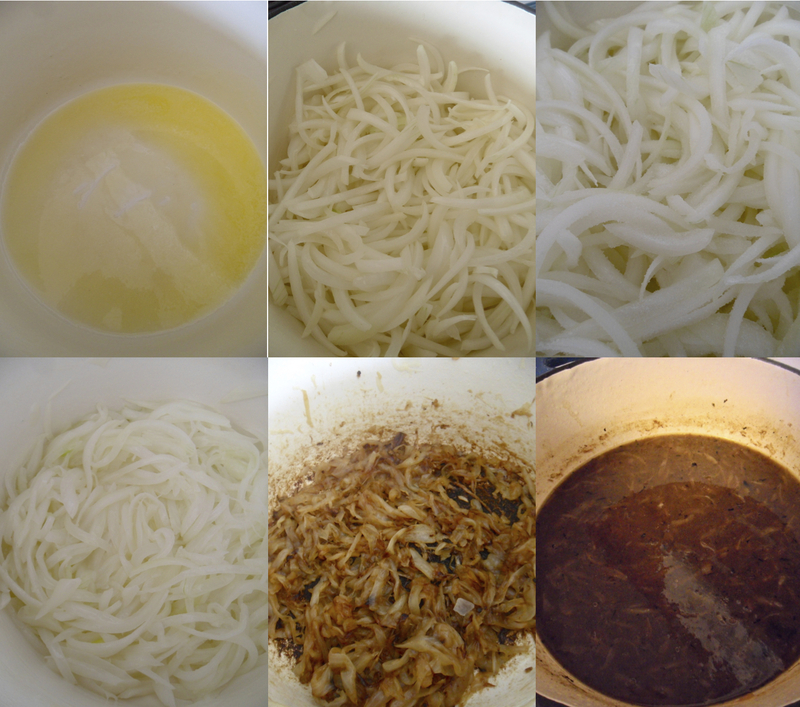 In the morning you can make the Onion Soup because it can sit all day once finished and just be reheated before serving. Put the 3 tbsp unsalted butter and 1 tbsp vegetable oil in a heavy bottomed dutch oven, add 1.5 lbs sliced white onions (about 5 cups) and cook over medium-low heat for 15 minutes, covered. 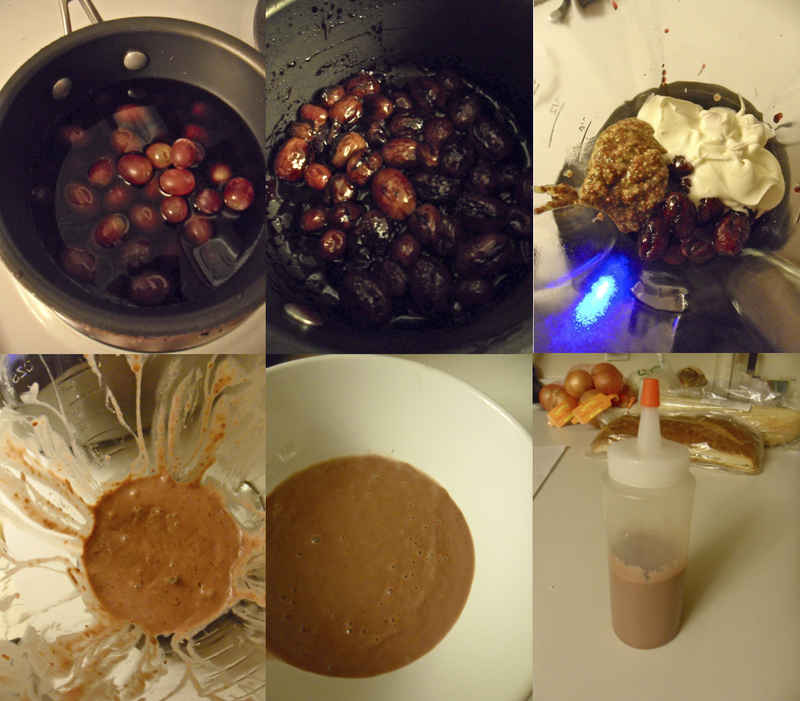 Uncover and raise heat to medium-high, stir in 1 tsp salt and 1/4 tsp sugar. Cook for 30-40 minutes stirring frequently until onions are a deep and even brown. Sprinkle in 3 tbsp flour and stir for 3 minutes. Add the 2 quarts of boiling beef stock and 1/2 cup dry white wine or vermouth. Simmer, partially covered for 30-40 minutes, stir occasionally and correct the seasoning. Set aside uncovered until time to serve, then reheat to a simmer. Next make the croutons for the soup by cutting a french baguette into slices and roasting in the oven at 325 degrees for a half hour. Drizzle with some olive oil halfway through and rub with whole cloves of garlic once done. To finish off the sandwiches: Remove the sandwiches from the freezer about a half hour before frying. Heat enough canola oil to come up about an inch in your pan over medium-high heat to 325 degrees (Make sure you use a thermometer and that the oil stays at that temperature for at least 5 minutes before dropping the sandwiches in so that they don’t burn). Place 1/2 cup panko in a shallow dish and coat the sandwiches. Add sandwiches to oil and cook 2 minutes per side until golden brown. Transfer to paper lined plate and drain. Heat up 2 tsp olive oil in a small frying pan and fry up large eggs to serve on the side. To finish off the soup: Place the croutons inside of a soup crock and pour soup over the crouton to the top of the crock. Add your gruyere cheese (I used the leftover slices from the sandwiches but grated gruyere works better) and drizzle with a little olive oil. Place under the broiler for a few minutes until browned and bubbly. To put the whole dish together: Put the crock of soup on a large plate and then drizzle the mustard onto the other half of the plate. Cut the sandwiches on bias and stand them up on top of the mustard with the fried egg on the side. Serve with the Beaujolais Nouveau. this looks AMAZING and i love your little soup pot. Love the blog too, I shall be back. Thanks… The soup pots came from Bed, Bath and Beyond… A set of 4! I love them!